I've been in the industry for over 30 years now and for the last 18 years I've worked within Lawrie’s Boat Services on the Sunshine Coast, where it began as a one man show with one shed. I now have four sheds, a chandlery and a talented team of 15 - 20 skilled workers depending on workload. I've designed designed and built dozens of catamarans, trimarans and monohulls from start to finish which has provided me with an extensive working knowledge of ALL boats. These days I do vessel maintenance, refits, resprays, motor installs and stainless work. Ashby Boat Builders is one of the preferred insurance repairers for Club Marine, Nautilus, Youi, QBE, Pentanious, Suncorp and RACQ. I live around the corner from my business and pride myself on my workmanship. Ashby Boat Builders completes approximately 150 - 200 boats per year. From simple antifouls to complete refits and resprays. Operating out of Lawries Marina on the Sunshine Coast, servicing local, interstate and international clients Ashby Boat Builders pride themselves in delivering a quality and professional job at all times. No job is too small or too big. 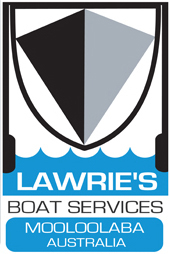 Lawries Boat Services has a fully sealed hardstand, 44 tonne straddle carrier, mobile crane, individually enclosed bays (all bays have power and water connected), vessel cradles, covered re-fit sheds, sand blast bay, work dock, waterblasters and chandlery. Clean male and female bathrooms, showers and ample off street parking are available for all clients. The yard caters to a wide variety of recreational and commercial vessels including all types of monohulls, catamarans, trimarans, power boats and pleasure craft. Road transport deliveries throughout Australia can also be arranged.